So says Egon von Greyerz (www.goldswitzerland.com) in edited excerpts from his original article* entitled Gold & Silver Off to the Races. 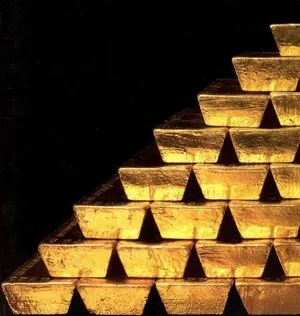 Gold reveals governments’ deceitful actions in destroying the value of paper money and the wealth of nations. Western governments dislike gold because gold tells the truth and the truth is that since August 1971 the US dollar has declined 98% in real terms [as can be seen in the graph below]. Before this debt cycle comes to an end in the next few years, the dollar and most major currencies are likely to finish their move down against gold and lose 100% of their value. Since 98 % has already been lost in the last forty-one years, there is really not far to go. The final fall of currencies will be as a result of the unlimited money printing that governments will embark upon in the next few months in order to endeavour to “save” the world economy. Money printing, however, does not save anything, it just exacerbates the situation. You can never become debt free by issuing more debt and you cannot create prosperity with worthless pieces of paper. There has never before been a time in history when most sovereign nations are bankrupt and when the financial system only survives due to false accounting (banks are allowed to value worthless toxic debt at maturity value rather than market value) so, sadly, we are now likely to start the next phase in the world economy which is a hyperinflationary depression. Hyperinflation arises as a result of money printing which leads to the currency collapsing. Whilst the price of most goods and services go up dramatically with hyperinflation, most of the assets that were financed by the credit bubble like stocks, bonds and property will collapse in real terms i.e. against gold. For the last couple of years, all the focus has been on the travails of the Eurozone countries. The Eurozone individual members’ dilemma is that, unlike the USA, they cannot print money. German political pressure stops that country from printing money for the Greeks to retire at 55 or to support the Spanish banks from collapsing. Germany is in a massive dilemma because if they contribute to the Eurozone’s money printing, they will increase their exposure and throw good money after bad. Also, it would be unacceptable politically. If they don’t print, however, the German government and banks are likely to lose in excess of €1 trillion which is their total exposure to the weaker European economies. Thus a virtual lose – lose dilemma for Germany awaits. Both US debt to GDP and budget deficit to GDP are worse than Spain’s – and Spain is seen as a basket case. Real US unemployment (23%) is also much worse than in most European countries. Also, if toxic debt and derivatives are included, US bank balance sheets are looking very sick. JP Morgan alone has a $100 trillion derivative exposure. And we know how quickly derivatives become worthless with JPM’s latest $6 billion write off. In addition, the US annual federal deficit is likely to remain in the trillions for many, many years to come. These amounts dwarf anything happening in Europe. there will be pressure on the US dollar which eventually will put strong upward pressure on interest rates. The free money bonanza with zero interest rates will come to an end with US rates (and others) soon starting their journey to double figures. Governments and central bankers must have thought that they had invented a financial Perpetuum Mobile. First you set interest rates at zero and then you print and borrow unlimited amounts of money since it is all free. This way we can all experience Shangri-la. But sadly, governments have not reinvented paradise but only been busy creating a fraudulent Ponzi scheme and, like all Ponzi schemes, this one will also collapse creating worldwide social and economic misery for many generations to come. Physical precious metals, as well as PM stocks, will continue to reflect the destruction of paper money…Gold and silver have now started a major move to the upside. This move will be relentless with only minor corrections before we reach $4,500 to $5,000 in gold and substantially over $100 in silver. Investors now have a last chance to invest in gold and silver at prices which will never be seen again. For wealth preservation purposes, however, it must be physical metals and it must be stored outside the fragile banking system. 1. von Greyerz: Gold Going to $3,500-$5,000 in 12-18 Months – and $10,000 Within 3 Years! My Fractal Gold chart work is a direct comparison of Gold, today, to the late 70’s Gold Parabola. Thus, “timing” is taken directly from the late 70’s cycle, with price targets created from a combination of the late 70’s Gold price and different technical analysis techniques. We developed a price target back in 2006/ 2007 for Gold to reach the $10,000 to $12,000 range during this Gold Bull and we still stand by that forecast. Let me explain where we are at this point in time. 4. New Analysis Suggests a Parabolic Rise in Price of Gold to $4,380/ozt. Next Don't Ignore This Fact: "Greedometer Gauge" Signals S&P 500 Drop to the 500s by July-August, 2013!